preheat 350 degree oven. Prepare three dishes. One for the sausage, one for the eggs and one for the breadcrumbs.dip the patties in eggs and then crumbs, when all breaded heat oil in fry pan on med hi heat and fry until lightly golden on each side. Drain on paper towels. Add the peppers, salt and pepper to the pan and cook about 10 minutes until soft, set them on the side. Prepare baking dish, put a layer of sauce on bottom of pan. Now lay the patties in the dish. 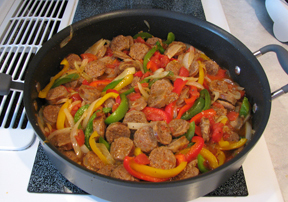 Lay the peppers over the patties add the remaining sauce, sprinkle parmesan and mozzarella cheese all over the top. Bake 30 minutes until bubbly. Serves 4-5 hungry people.